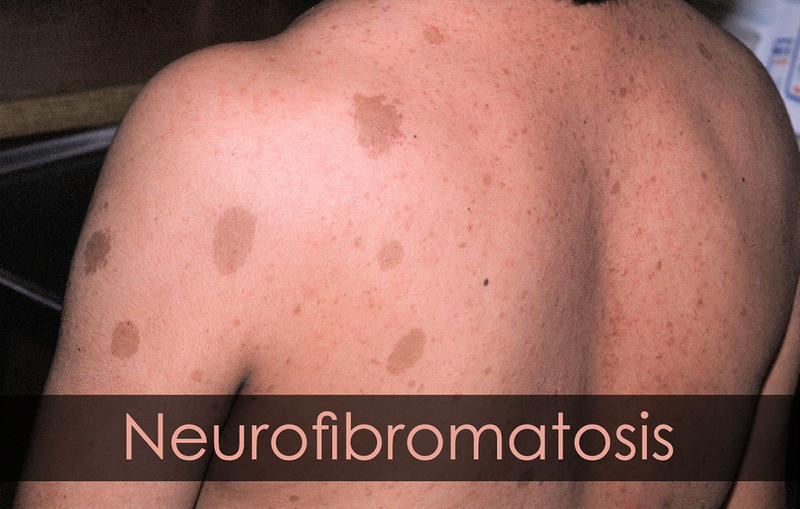 Neurofibromatosis or von Recklinghausen’s disease may be defined as the condition that is characterized by multiple neuro-fibromas and pigmented skin spots (cafe au lait spots). Three main conditions are responsible for causing tumour growth in the nervous system. Neurofibromatosis type 1, neurofibromatosis type 2 and schwannomatosis are the major three types. These patients have the family history consistent with autosomal dominant inheritance in 50% of patients. Neurofibromatosis in von Recklinghausen’s disease is ideally characterized by numerous nodules of varying size, seen along the small cutaneous nerves but may also be found in the visceral branches of sympathetic nerves. It may involve a group of nerves or may occur as multiple, oval and irregular swelling along the length of a nerve. Neurofibroma has the tendency for local recurrence after excision. It is estimated that about 3% of patients with neurofibrotomasis develop malignant transformation of the one nodule. Rarely neurogenic sarcoma may develop spontaneously in the absence of pre-existing von Recklinghausen’s disease. A major cause of this serious disorder is gene mutation in certain genes. Neurofibromatosis type1 is a genetic disorder having the mutation in chromosome 17 while type2 has a mutation in chromosome 22. In major cases, this is inherited from parent to offspring. 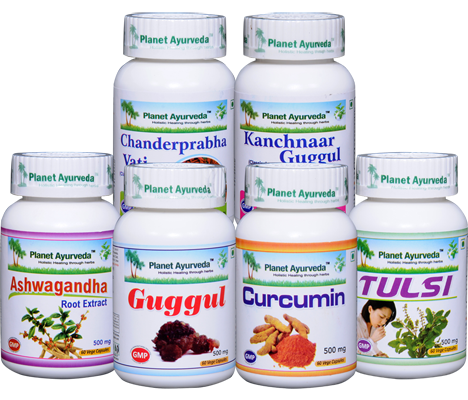 Planet Ayurveda provides a very effective herbal supplement in form of capsules to treat neurofibromatosis. In this herbal formulation, pure extract of Withania somnifera is used. It is a very effective herb that is used to maintain healthy cellular and molecular level of cells and tissues in the body. It helps to promote healthy growth of cells in body. It is a very effective energy booster and used to stimulate our immune system so that it can fight against various infectious and cancerous cells growing in the body. It helps to maintain the equilibrium between three doshas and helps in the elimination of harmful toxins out of the body. Its anti-stress action helps to calm brain cells and relieve stress and anxiety. It is also helpful in maintaining physical and mental levels in body. It is also beneficial for reducing high cholesterol level and promotes healthy cell growth. Dosage :- 2 capsules daily after meals with plain water. Curcumin capsules are again very effective and beneficial herbal supplement of crab care pack that is used to treat this disorder naturally. It helps to support the internal structures of cells. The pure extract of Curcuma longa is used to prepare this wonderful herbal supplement. Curcumin is the bioactive substance that works wonderfully on various neurofibromas. Its anti-inflammatory properties help to reduce internal inflammation of organs and also helps to repair weaken and destroyed muscles. Its anti-oxidant and anti-microbial properties help to fight against various infections. It protects internal muscles and cells from the attack of harmful toxins and wastes. It is also a very good blood purifier. Dosage :- 2 capsules twice daily with plain water after meals. Pure and standardized extract of shunthi, pippali, maricha, varuna, kanchnaar bark, amalaki, haritaki and bhibhtaki are used to prepare this effective supplement. All the herbs used in this herbal formulation are anti-cancerous in nature that helps to decrease the size of cysts and fibromas naturally without any side effects. It is very effective in treating various types of tumours and to remove blockages. Anti-inflammatory properties of this herbal product help to reduce internal inflammation. Dosage :-2 capsules twice daily after meals with plain water. Pure guggul is used to prepare this herbal supplement. Guggul is a pure form of resins obtained from the tree Commiphora mukul. It helps to reduce the hardening of vessels and arteries. It helps to maintain the overall health of muscles. Its anti-oxidant properties helps to fight against various infectious conditions. It is also good in supporting immune system. Dosage:- 2 capsules twice daily after meals with plain water. Shilajit, guggul, sharkara, panchlavna, vacha, mustak, haridra, amalaki, chavya, vidanga, guduchi, shunthi, maricha, pippali, ela, danti, dalchini and tejpatta are the various ingredients used to prepare this effective herbal formulation in form of vati. It is very effective and miraculous formulation that is used to pacify aggravated tridosha in the body. It is useful in treating tumours, cancers and fibroids and useful in decreasing various underlying symptoms. Dosage:- Daily 2 tablets two times daily after meals with plain water. All the supplements of crab care pack help to support and maintain overall health. These above- mentioned products are 100% pure and vegetarian. These herbal products are formulated under the supervision of MD doctors. All the herbal products are free from chemicals, binders, preservatives, starch, additives, colours, yeasts and fillers.